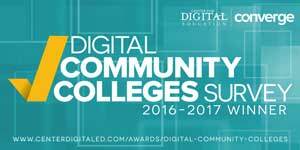 For the fourth straight year in which it’s been eligible, Carl Sandburg College has been named the national champion in the Small Colleges category of the Digital Community Colleges Survey by e.Republic’s Center for Digital Education. This marks the fifth time overall that Sandburg has been honored as the best in its category, which includes community colleges with less than 5,000 students. It’s also the ninth straight time the College has placed in the top 10 of its class. Sandburg served as a contributor for the 2016 survey and was not eligible to receive any awards. 40 stations in the Tech Help area of the library. Laptops and iPads that can be checked out (items must remain in the library). 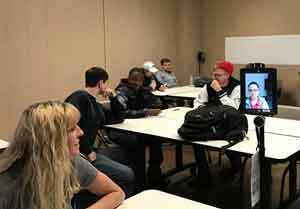 Every classroom can be a virtual classroom, allowing for off campus attendance via webinar software or more recently, telepresence robots! The robots provide more opportunity for student-to-student interaction as well as student-teacher and classroom engagement. In need of Technology Help? Students can visit the Tech Help Desk located in the Library and available whenever the Library is open. This is a great resource for students to utilize.